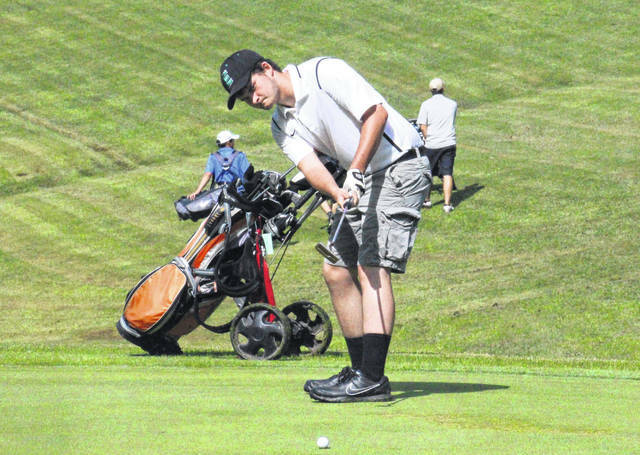 Ryan Harbour putts on the second green at the Meigs County Golf Course, during the Capehart Golf League on Monday in Pomeroy, Ohio. Jensen Anderson tees off on the third hole at the Meigs County Golf Course, during the Capehart Golf League on Monday in Pomeroy, Ohio. 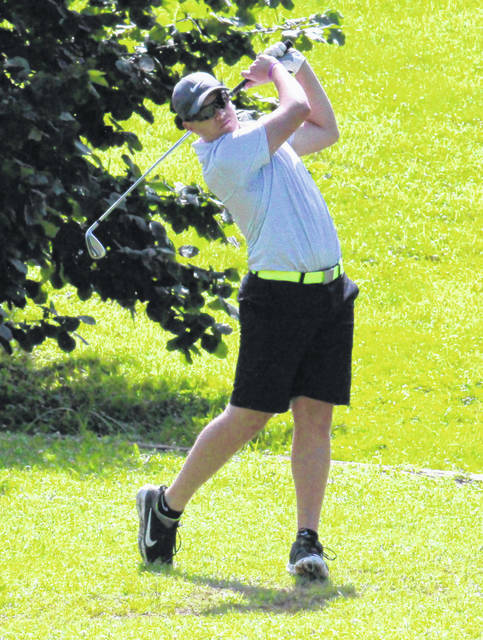 POMEROY, Ohio — The second tournament of the 2018 Frank Capehart Tri-County Junior Golf league was played on Monday at the Meigs County Golf Course. The weather was almost perfect, the conditions were partly cloudy with a refreshing breeze at times. The golf course was in very good condition. New management of the course has made the course and the clubhouse most appealing. A total of 39 players enjoyed the course and the conditions. A good crowd of spectators watched their sons, daughters relatives and friends take part in the days’ activities. The low score in the 10-and-under age group was shot by Grant Roush. Grant’s score of 41 included a chip in from off the green on one hole. Alec Conway’s 51 earned him second place for the day. The 53 shot by both Riley Cotterill and Timmy Russell placed them in third place for today’s tournament. Noah Leachman, Porter Midkiff and Carter Casto also played in this group. Ali Norris once again led the ladies in this age group shooting a 63. Ali was followed by Teagan Conway’s 65 and Brooklyn Smith with a 68. In the 11-12 year old age group, Caleb Pierson and Joe Milhoan traded places from the results achieved in the initial week’s play. Caleb was first on Monday with 52 strokes while Joe’s score was only one stroke behind with a 53. Evan Pope finished third in this group with a score of 64. Ethan Roberts shot a 68 placing him in 4th place for the day. The scores for the ladies in this group were also very close with Lorena Canady’s 65 edging Marlo Norris by a single stroke. Five young men and two ladies took part in the 13-14 year old age group. Zack King was the winner in the boys’ division shooting 46 for the day. Brennen Sang finished second in his initial appearance this year scoring a 52. Landon Atha was third with a score of 54. John Greer and Ethan Marcum also played in this group. Caitlin Cotterill and Shelbe Cochrin both had some very good shots and ended up with the same score of 54 earning both of them a first place trophy for their efforts. Nine young men and one lady played in the 15-17 year old age group. The competition was close for the guys with Whitney Byrd and Wyatt Nicholson both earning a share of first place with scores of 39. Ryan Harbour finished third with his score of 42. A score of 44 brought a fourth place finish for Jensen Anderson. A score of 45 gave Jarrett Hupp and Bobby Musser a tie for fifth place. Ryan Acree, Trenton Peacock, and Gus Canady also played in this group. Haley Pierson was the lone female to participate in this group. Her score of 52 gives her the first place trophy. The competition in the 18-19 year old age group was tight between Levi Chapman and Douglas Workman. Levi came out on top with his medalist winning score of 36, while a score of 38 gave Douglas a second place finish. Bryce Swatzel shot a 46 to finish in third position. Bryce Tayengco playing in his initial tournament of the year shot a 49 to claim fourth place today. Theo McElroy finished in fifth place. Veteran Kaytlyn Hawk was also playing in her first tournament of the year. Her game was a bit rusty, but she still managed to turn in a respectable 53 for the day. All in all, tournament officials felt it was a successful day. The weather was good as was the course. The players were treated very well and enjoyed a lunch of hot dogs, chips and a soft drink. Next Monday’s tournament will be played at the Riverside Golf Course in Mason, WV. The entry fee is $10.00 per player which includes a small lunch at the conclusion of the day’s play. Play will begin at 9:00 a.m. with registration starting a 8:30 a.m. Play is open to all area youth age 19 and under. Please feel free to contact any of the following if you have questions: Jeff Slone, 740-256-6160, Jan Haddox, 304-675-3388 or Bob Blessing, 304-675-6135.